I really hate to sound like a sycophant. After the glowing review I gave to the last issue, you would think I should tone it down a bit. But I cannot. I must gush. Make like you're at at Gallagher show and reach for the plastic. 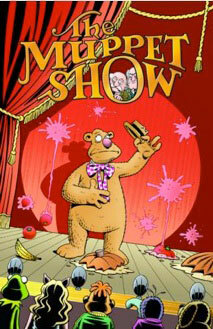 Roger Langridge manages to top his excellent premiere issue of THE MUPPET SHOW. But how is that possible, Doug? You already said that was as good a Muppet comic as one could ever hope to make. And yet issue two proves me wrong. Langridge delivers a tighter script that takes better advantage of the vaudevillian setting. There are classics like Pigs In Space, as well as a salute to some of the more esoteric set pieces from earlier seasons and one of Henson's favorite devices- the running gag. Plus Gonzo delivers a magnificent pun followed by a definitive sardonic aside. And as much as we all love Kermit, it's Fozzie who totally brings it this time around. The main storyline about his efforts to get back his comic mojo feels much more natural than Kermit's existential angst in issue #1. The bear is Willy Loman meets Henny Youngman, desperately searching for a schtick that can bring down the house. And of course it's that musical sage Rowlf who offers the most productive advice. The issue doesn't hit stands until tomorrow and already a second printing has been announced to accommodate orders. So get 'em while you can. Wakka wakka wakka.